I’ve had some time with a production sample of the Lenovo Yoga 710 and while I can’t bring you a full review there’s a lot I can tell you about it. 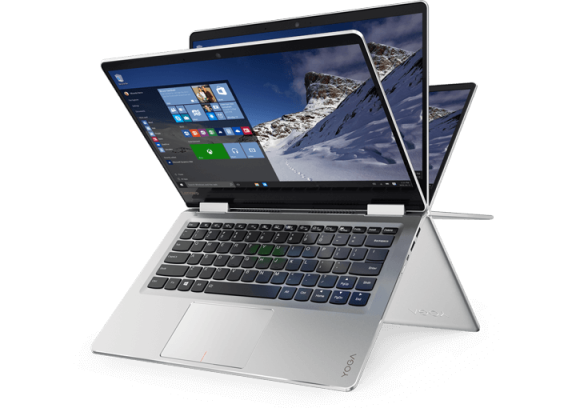 The Yoga 710 is an 11.6-inch ultramobile Windows convertible (laptop-style with 360-degree hinge) running on a Core M CPU. Bloggers had unlimited access to it at CeBIT earlier this month and were able to draw a lot of conclusions. Here’s my summary review. The Lenovo Yoga 710 is incredibly slick, has a great screen and the keyboard is working very well, at least for me. It’s Macbook-like for sure but not quite the fasion-piece and it’s likely to be offered at a lower price, according to reports. For me it’s one of the most important subnotebooks of the year. Note: All information here based on the pre-production sample shown at CeBIT. At 1.29 KG this 13-inch touchscreen laptop creeps inside our radar for ultra mobile PCs, and it does it in style. I’m not talking about the amazing edge-to-edge display or the great casing materials, I’m talking about the stamina of the Dell XPS 13. I’ve just produced a video of the latest version with Core i7 Skylake inside and the QHD touchscreen. It’s not cheap at over 1500 euros but there’s a Full HD non-touch matte-screen version available that weighs 90 grams less and will save you a few hundred euros. The new XPS 13’s have USB-C with Thunderbolt and a re-worked trackpad but there’s not much else that’s different on the outside. 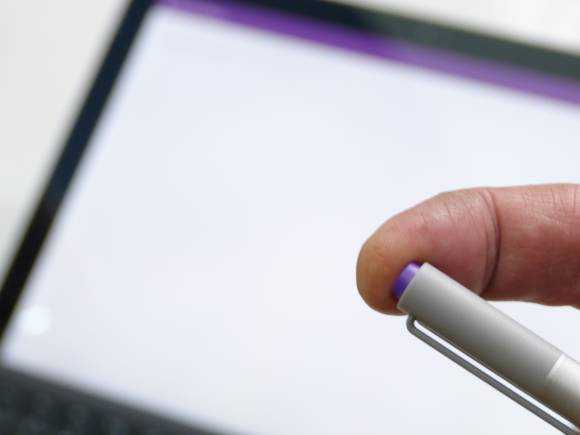 Surface Pro 4 overview, from a Surface Pro 3 user. Is it worth upgrading? I have a Surface Pro 4 with Core i5, Type Cover keyboard and docking station with me now and I’ve just finished the first of a set of videos for Notebookcheck (see it in the Surface Pro 4 review here) and come away, as you’d probably expect, impressed. One of the first things I did, however, was to put the new Type Cover keyboard on my Surface Pro 3. The ‘upgrade’ is significant and is one of a number of considerations to be made if you’re thinking of making the jump from Pro 3 to Pro 4. Hopefuly you’ve seen the news that Microsoft has sent out invites for an Oct 6th Windows 10 event in New York. No-one doubts that we’re going to see Lumia, Surface and Band products along with an official launch of Windows 10 Mobile which makes it an extremely important event for anyone who reads UMPCPortal. Lumia, with Continuum, could form an important part of an entry-level ultramobile PC set-up. Surface sits at the very high-end of ultramobile computing solutions. It seems certain that we’ll see a Surface Pro 4 with much the same sizing as the previous model but two questions remain unanswered. 1) Will it be fanless? and 2) Will there be a second, 14-inch model? The reason I ask the latter is that there have already been rumors about a 14-inch model and in a recent search I found screen covers for a 14-inch Surface Pro 4. If a 14-inch model is coming how can Microsoft position the two devices ? There’s a poll below and i’d like to see what you think would be the best constellation of Surface Pro 4 devices. But first, some thoughts on what’s possible and what it brings to a 12-inch and a 14-inch Surface Pro 4. 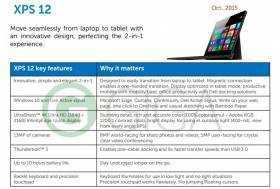 Latest Dell XPS 12 switches to tablet design, InfinityEdge display. 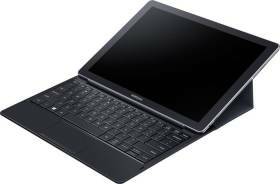 It looks like the Lenovo Miix 700 is going to get some strong competition in the 12-inch 2-in-1 space because details are emerging of a new Dell XPS 12 tablet with docking keyboard, USB-C and an edge-to-edge display. Giga.de have followed up their Venue 8 Pro leak with a slide of information on a new Dell XPS 12 showing that Dell have moved on from the carousel design to a docking tablet set-up. Brief information shows a 4K display which may, or may not, excite you. The same goes for the edge-edge Infinity display which removes the oft-important frame. IFA 2015 – One piece missing. 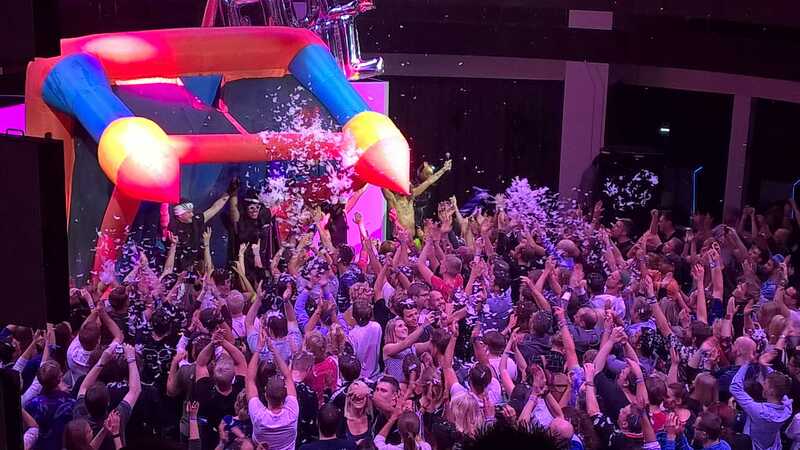 IFA 2015 was as fun and as busy as ever. I managed to get quality hands-on time with a lot of new ultramobile PCs (mostly without the pressure of press-event chaos) and had some great conversations, both public and private, with companies working in the sector. Thanks to Intel for their blogging facilities and an amazing party, Acer for the bright and spacious video-friendly booth and Microsoft for a good evening of networking. Having said that, I didn’t see what I wanted to see. Next-gen Core M launches to boost 2-in-1 market opportunities. 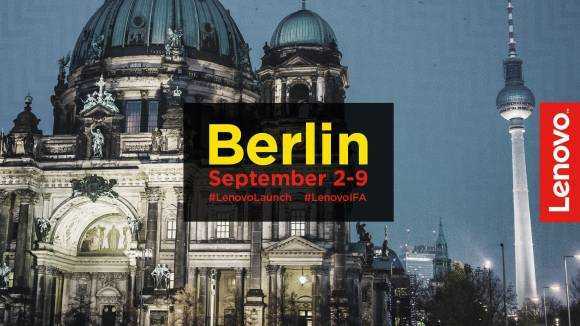 The next generation Core M processors, based on 6th-gen Core technology launched at IFA 2015 in Berlin today. The Core m range now splits into a familiar structure. Core m3 Core m5 and Core m7. Chromebook, News Comments Off on Next-gen Core M launches to boost 2-in-1 market opportunities. Lenovo Yoga 900 Skylake convertible appears. IFA launch possible. A full week before we expect Intel’s Skylake 6th-generation processors to officially launch there’s a signal that Lenovo will be launching a new Yoga 900 with Skylake architecture inside. Unlike the Yoga 3 Pro from 2014 it will have a full-fat Ultrabook-style processor. Core i5 and i7 should offer significant performance improvements over the previous generation Yoga 3 Pro. News Comments Off on Lenovo Yoga 900 Skylake convertible appears. IFA launch possible. Intel WiDi to get real-time encoding support. 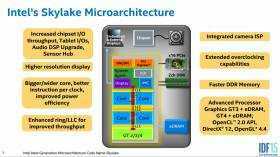 Intel’s Wireless Display, a superset of the Miracast wireless display standard is going to get a boost with Skylake and an on-board real-time video encoder. It should improve latency and efficiency and Intel thinks it will be good enough to extend WiDi to wireless-screen gaming. News Comments Off on Intel WiDi to get real-time encoding support. A detailed overview of the Intel ultramobile processor range. There wasn’t a huge amount of ultramobile PC content for us at the Intel Developer Forum this week. IoT, robots and wearables were taking the limelight along with gaming, big data and, for the first time, cyber security. 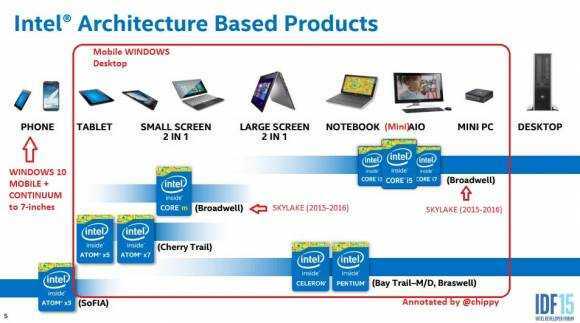 A breakthrough in storage technology could reach ultrabooks in 2016/2017 but before that happens there’s Skylake, the 6th-generation Core processor that will end up inside Ultrabooks and high-end 2-in-1 PCs, probably including Surface Pro 4. Intel didn’t reveal many details on stage but they’ve published a set of PDFs that we’ve already dissected. Skylake is the latest brand name to hit the ultramobile PC space but where does it fit into the big mix of ultramobile processors that Intel has? 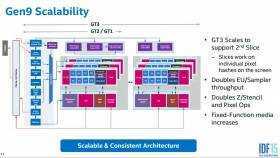 In one of the IDF sessions Intel presented a very detailed comparison of all the mobile CPUs, and that’s exactly what we’re going to take a look at in this article. Sit back and enjoy a tour through the complete range of processor, graphics, media, storage and memory technology capabilities that are on offer to ultramobile PC manufacturers. This report may be updated with more Skylake information as information is released. 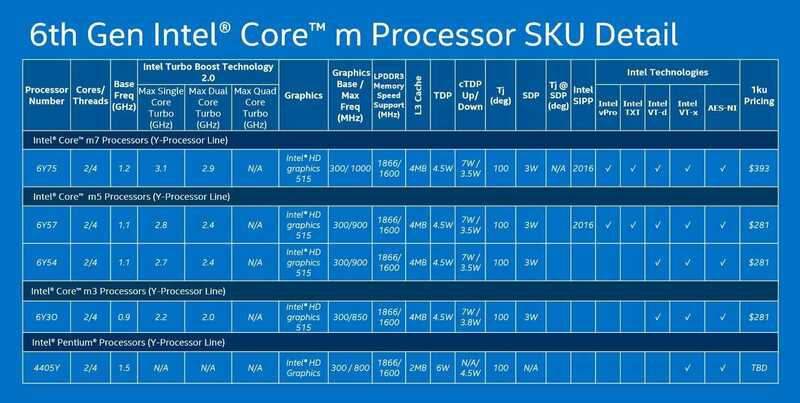 Intel’s Skylake details, Surface Pro 4 clues. You’re looking at what is highly likely to be the processor details for Microsoft’s Surface Pro 4. 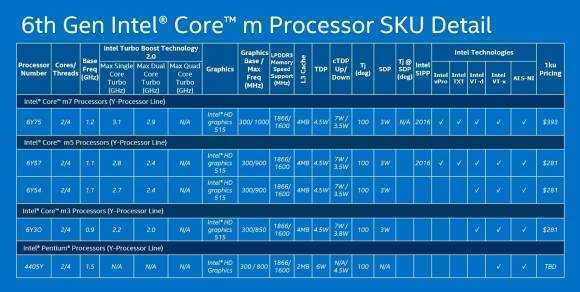 Intel have just released architecture and feature details for Skylake, the next generation 4W-to-64W mobile processor. Read on for a feature-by-feature insight. If you want to jump to the details, these two links should take you directly to the Intel IDF slide-set PDFs. Skylake Architecture. Skylake Gen 9 GPU.